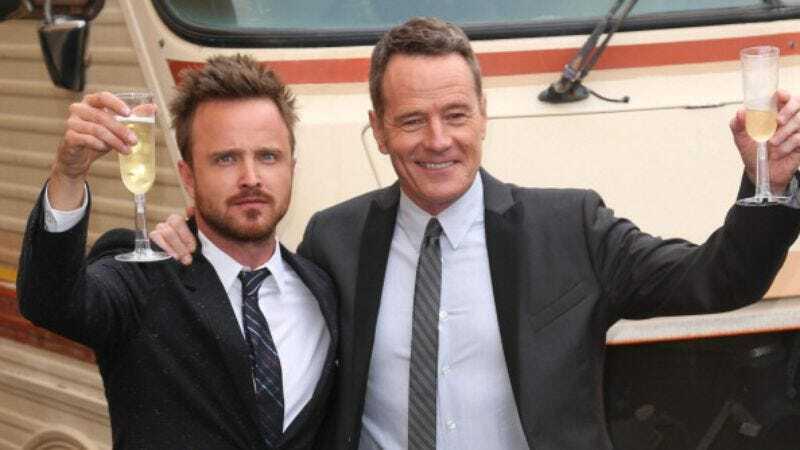 The Breaking Bad premiere was yesterday, and pretty much everyone from the show showed up, including the R.V. Uproxx has a slideshow of the whole affair, but it looks like everyone from Walt and Jesse to Gale, Gomie, Skylar, the twins, Todd, Mike, and Walt Jr. and the girl who played the popular girl from She’s All That had a pretty good time hanging out, drinking champagne, and totally not doing meth. Unfortunately Dean Norris and Betsy Brandt weren’t there, but let’s just imagine they were at home together thinking about why they own so much purple furniture.